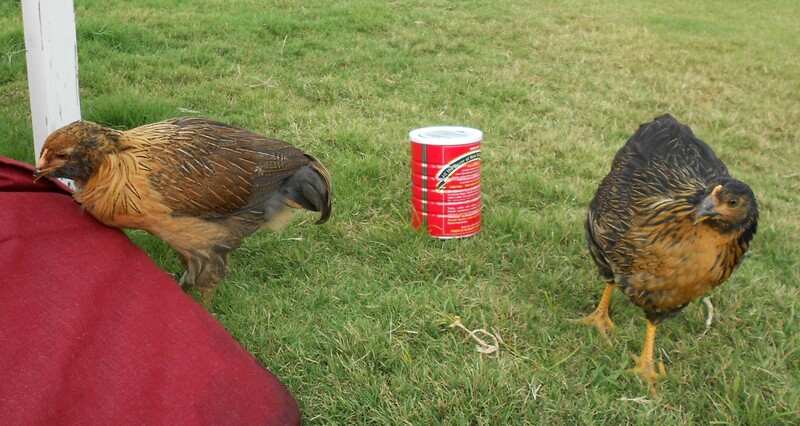 One of my chickens has finally made the connection between the scary red coffee can and yummy chicken treats. 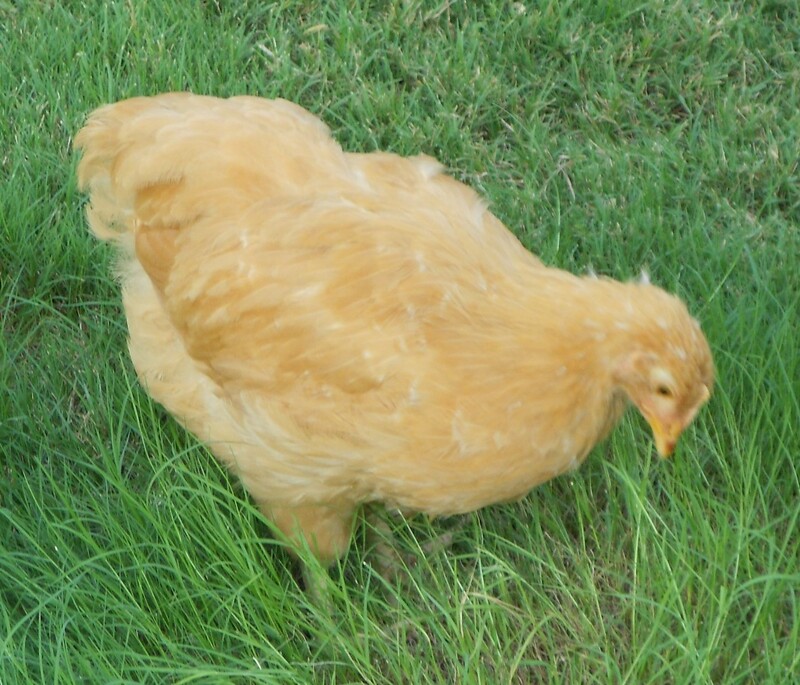 Last night I tried once again to “train” my babies to come running when I made the “shake-shake, here chick, chick” sound. And once again, they all three fled in terror. Then, Violet stopped in her tracks and a tiny little light bulb appeared over her head. I think it was one of those 3 watt bulbs you put in Christmas window candles. She looked at the can and I shook it once more and she waddled over while I poured some scratch on the ground. 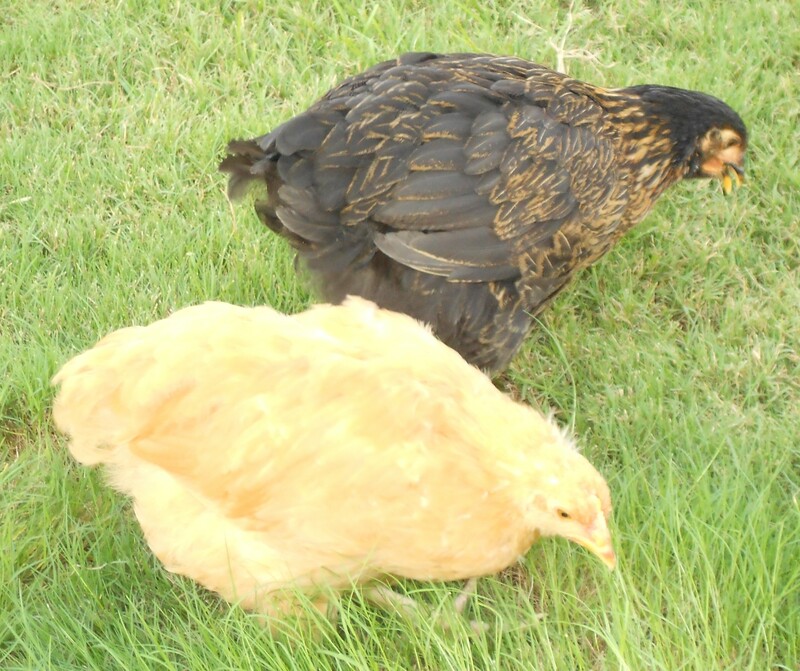 Daisy and Rosie followed suit and the three of them pawed and pecked at the ground like they were digging for gold! Eureka they found it! Another fun “training program” has begun in the B’game back yard as well. 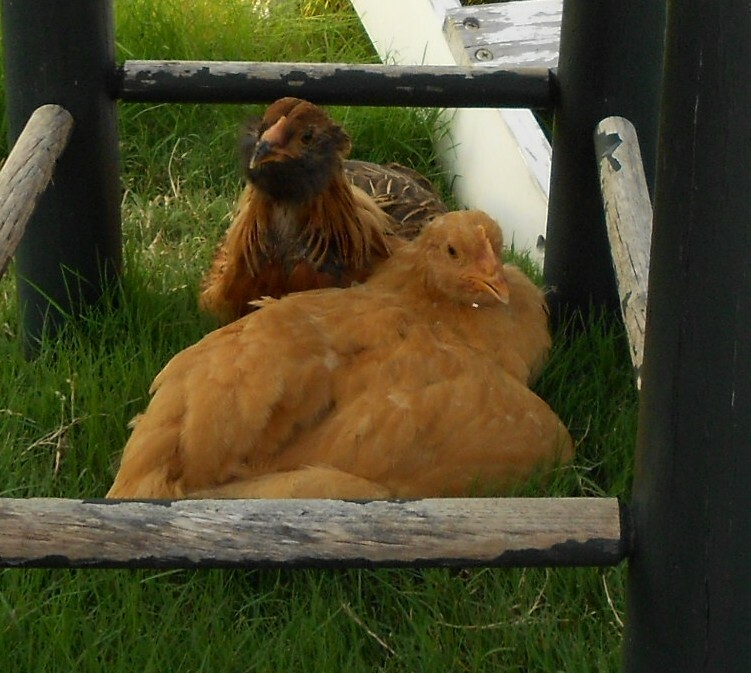 I decided that I really want my chickens to come sit with me in the evening. 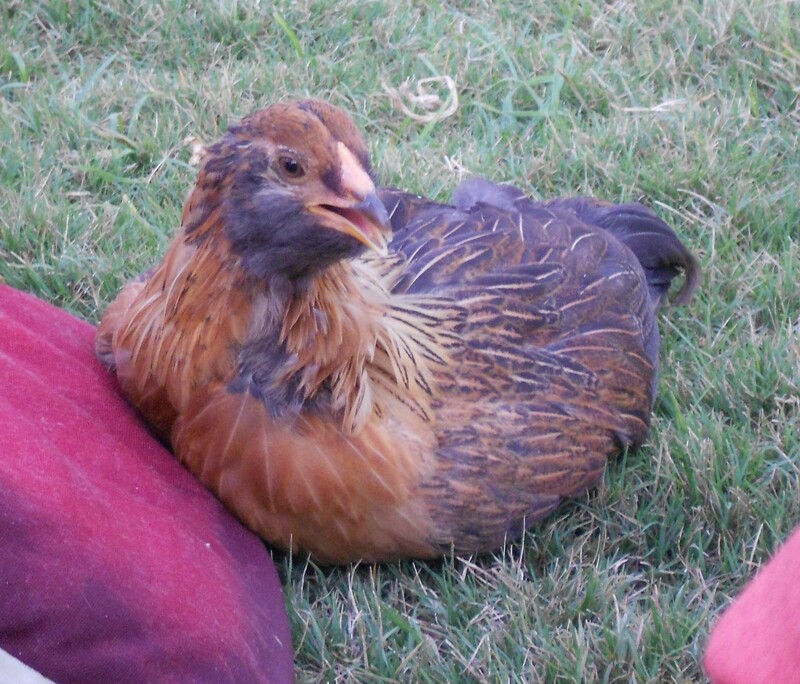 I got the brilliant idea to slice a few grapes in half and lure a chicken into my lap by enticing them with food. Buster actually gave me the idea. That’s how he learned that it’s fun to watch TV with Mom & Dad because there’s usually a treat in the middle of the living room floor. So I sat down and put a grape slice in two fingers and showed it to Rosie as she walked by me. She snapped it out of my hand and ran away. Daisy took her grape and calmly ate it next to my chair. When Violet strolled by, I showed it to her, then brought it nearer to me. She started at my foot and then climbed my calf and stood on my knee to get the grape. Tomorrow I’ll try to get her to climb the mommy all the way to my lap where I can hold her for a while. We’ll see how it goes. Two nights ago we had some new visitors who came to see the chicken show. 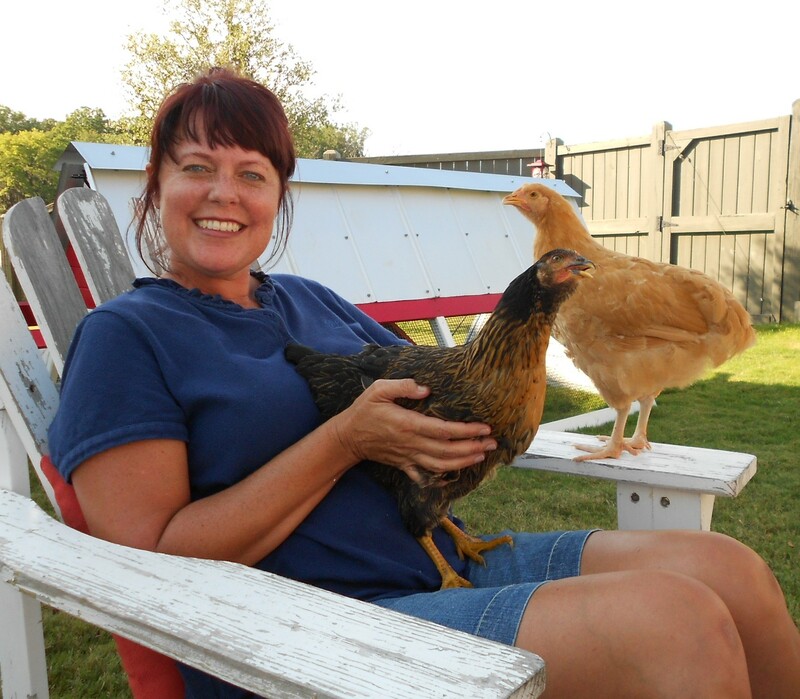 Our neighbor, Donna came by with her family because she heard that we had chickens who put themselves to bed. They got here right on time, because the ladies were just putting on their pajamas and drinking a final slurp of water. Just then, more neighbors, Jamie, Skeeter and Hudson came flying out of their golf cart asking, “Are we too late?” At precisely 7:50 Violet made her way up the stairs followed by Rosie, then Daisy. Thanks for the great show girls! I’m sure my reputation in the neighborhood is bordering on eccentric (I used to be called the “Bunny lady”) but I think it’s cool to have people come to my house to see my sweet, smart ladies go nite-nite. I’ll be on a short vacation this weekend and away from my computer so there won’t be a post for a few days. 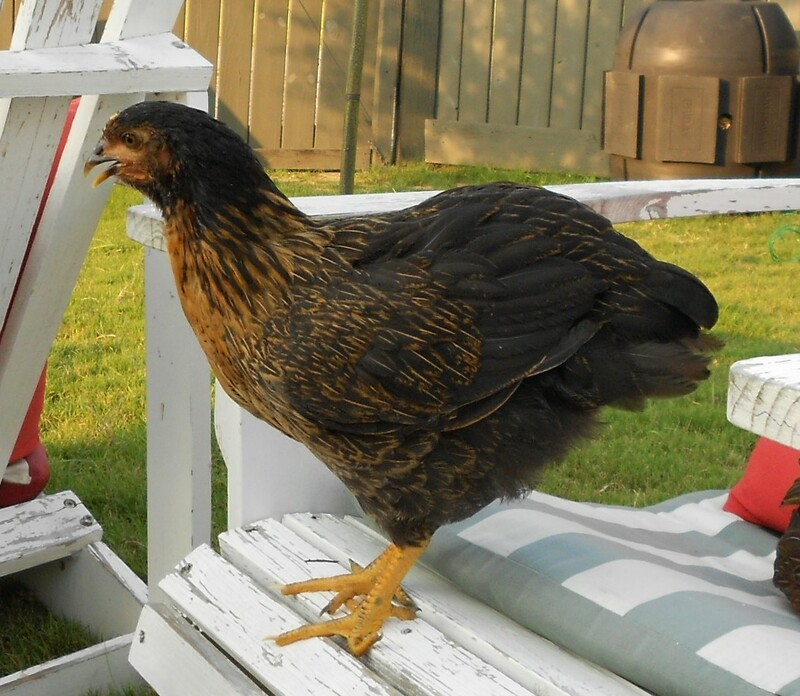 Rest assured my excellent chicken-sitter, Miss Tama will take good care of the ladies while I’m gone. I would not be surprised if she had taken them all for pedicures while we were away. Try to survive without the Chickendairy for a few days. Be strong!